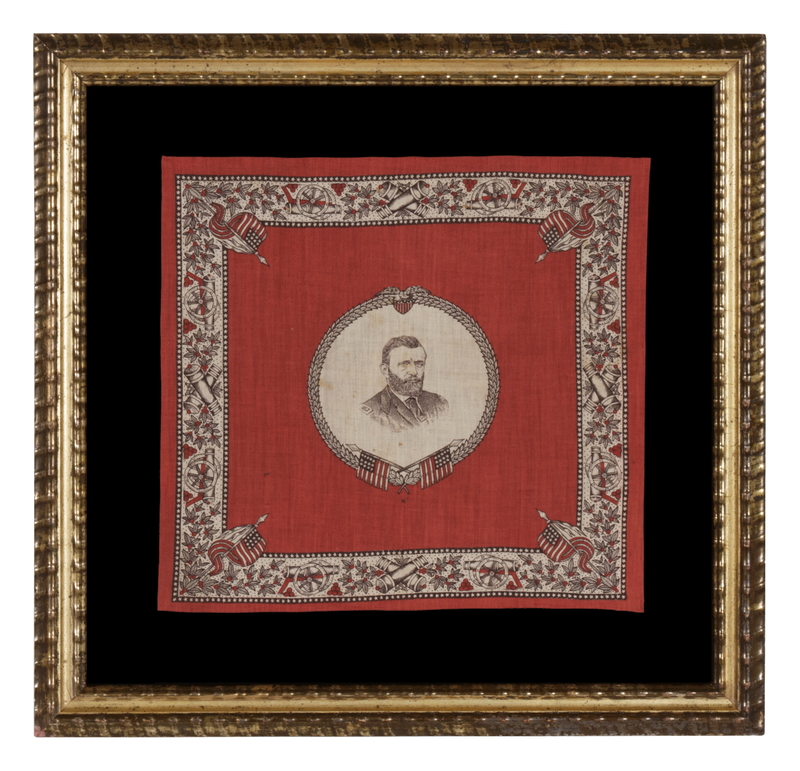 Flag Size (H x L): 13.75" x 14.5"
Printed cotton kerchief, made for one of the two presidential campaigns of Ulysses S. Grant. Framed in a wreath of olive branches, the center medallion contains a portrait, in military uniform, of the famous Civil War general who eventually followed Winfield Scott, George McClellan, and Henry Halleck, to become the fourth person to serve as General-in-Chief of the Union Army during the Civil War. Printed in red and black, a spread-winged eagle perched on a patriotic shield serves as a keystone, above Grant’s portrait. At the bottom are crossed 13 star flags with some unusual elements. These have the proper count of 13 stripes, but each starts and ends on white, which is a rare and unusual trait. Also, note how each vertically-oriented canton rests on a red stripe. This scarce, wartime feature is sometimes called the “war” or “blood” stripe. In addition, the star patterns are different on the two flags and each is unusual for the late 19th century. It is likely that the designer of the bandanna copied the flags from some 18th century source, as their elements are more consistent with the colonial era, when, according to surviving images, 13 star designs were more variable, more likely to have stripes that started and ended on white, and where vertically-oriented star configurations are more often encountered. The kerchief’s decorative border is both beautiful and unusual. This is comprised of crossed cannon barrels at left right top and bottom, flanked by full standing cannons and cannon balls, intermingled with leaf and berry designs. These are contained within fine borders of repeating stars. In each corner is a another 13 star flag, similar to those beneath Grant’s portrait, but each missing the 13th stripe. 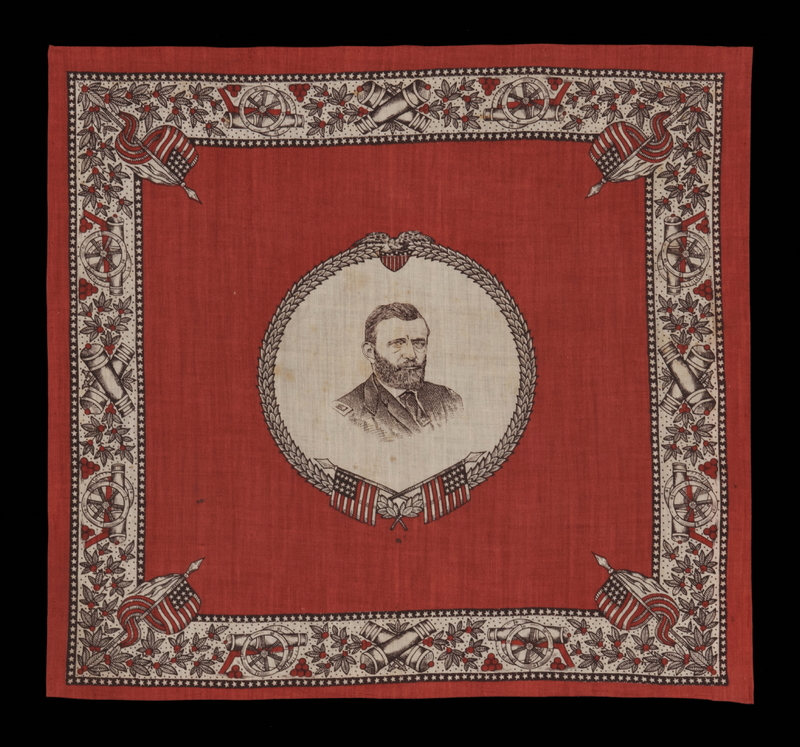 Almost all kerchiefs made for political campaigns before 1880 fall into the category of rare or extremely scarce, and those made specifically for Grant are particularly so. Five varieties have been identified within the collector community, including this one. Only a couple of examples are known within each variety, for a total of about 10 known examples, so all Grant kerchiefs are extremely rare. 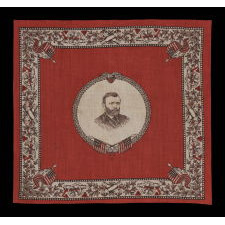 Only one kerchief made for 1868 is documented in “Threads of History” by Herbert Ridgeway Collins (Smithsonian Press, 1979), the 566-page compendium of political textiles. None are documented as having been made for the 1872 campaign, when Grant ran for a second time. Two examples of the cotton kerchief in question here are known, including this one. The other one has faded nearly to brown and this is the better of the two. Their scale is notably small when compared to most of its 19th century counterparts, particularly among the examples that pre-date 1888. 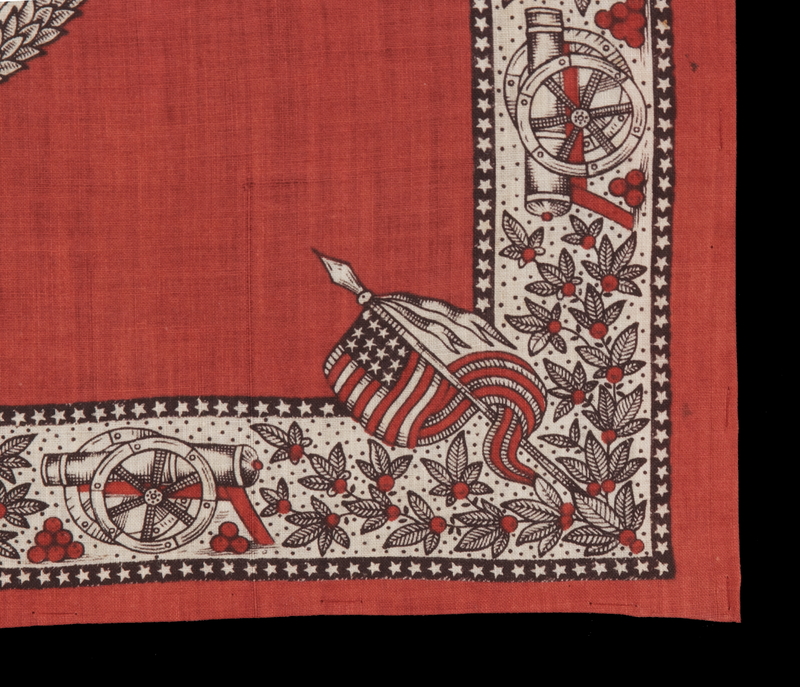 Two of the remaining four varieties of Grant kerchiefs are printed on silk and are extremely large in scale. One displays a portrait of Grant in military garb, presented with tools of war below him,. This is executed within a white rectangular window set on a solid red ground, with a black and white polka-dotted border, followed by a solid red one. Two examples of this style are known. Another in the same basic style survives with the same portrait device, but which lacks the black and white polka dotted border and is, instead, entirely red. It is the only know example in that style. Then there are two other cotton varieties. Both are red and are of a medium-sized in scale, more indicative of kerchiefs produced during the last quarter of the 19th century. One of these features an oak leaf and acorn border with eagles, flags, and has clasped hands in each corner. It is unclear how many of these are known, but the number is certainly fewer than five and a good estimate might be two or three. 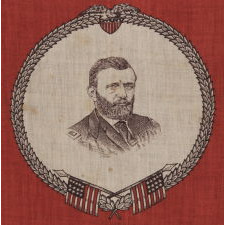 The other style has a wreath beneath the portrait with Grant’s initials, and a leaf and vine border containing the names of major Civil War engagements where Grant was involved. This is the only variety documented in any text and two examples are known, both of which are institutionalized. 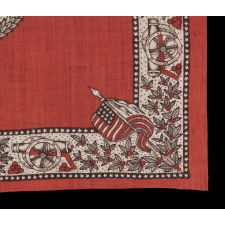 One example, in the collection of Cornell University, is featured as item 352 in “Threads of History: Americana Recorded on Cloth, 1775 to the Present”, by Herbert Ridgeway Collins (1979, Smithsonian Press), p. 180. Collins makes note of the second example, which is in the collection of the Chester County (Pennsylvania) Historical Society. While none of the five varieties are dated, it can be reasonably presumed that all may have been produced for the 1868 campaign. This is based upon the fact that many varieties of campaign flags were produced in 1868, when Grant ran for the first time with Schuyler Colfax, but practically none survive for 1872, when Grant ran for the White House a second time with Henry Wilson. President and General Ulysses S. Grant was born in Ohio in 1822, the son of a tanner. He was shy and quiet as a youth, and most who knew him then would never have expected forthcoming greatness. Like Robert E. Lee, his eventual counterpart, Grant was a West Point graduate and fought in the Mexican War. Unlike that of Lee, however, Grant’s early military career was far from illustrious. Forced to leave the Army for insubordination, as a civilian he went through six different jobs in just six years. When war broke out in 1861, he was working for his father’s leather shop in Illinois. Trained officers were scarce, so he soon returned to the Army and was placed in charge of an unruly group of Illinois volunteers that no one else would have. Accounts say that he drilled them nearly to their death, before leading minor, successful campaigns that turned heads and won him a promotion to Brigadier General. Various incidents and problems with alcohol caused many to plead for his dismissal, but Lincoln made the suggestion that “a case of whatever Grant was drinking” be sent to every Union General. “I cannot spare this man”, touted Lincoln, “...he fights.” In March of 1864, Grant’s continued determination caused Lincoln to place him in charge of the entire Union Army. In April of 1865, he cornered the main part of the Confederate Army near Richmond, Virginia, an act that caused the surrender of General Lee and ended the war. Following the failures of incumbent President, Andrew Johnson, Grant’s hero status won him the 1868 Republican nomination. He was elected, and although many shortcomings would cause Grant’s presidency to be widely criticized, he was known to be terminally honest, exceptionally loyal to his friends and staff (sometimes to a fault), and he was re-elected in 1872. While in office, he fought for equal voting rights for people of all races and colors, pushing the 15th amendment to its 1870 ratification. Grant strove to maintain order in the south with brute force, using the military to protect African Americans and combat southern extremists and hate groups, such as the Klu Klux Klan, which had been established in 1866 and was experiencing rapid growth. Grant died in 1885 and was interred in New York City (Grant’s Tomb). A member of the Whig party, before transitioning to the Know-Nothings and then becoming a Republican, New York City-born Schuyler Colfax served seven terms in congress, including three as Speaker of the House. He was jovial and well-liked by both the mainstream and radicals, which earned him the nickname “Smiler” Colfax. He served with Grant as Vice President for the first term only and was unsuccessful for re-nomination due to allegations of corruption in a business scandal. In 1872 Colfax was replaced by Vice Presidential running mate Henry Wilson, a leading senator from Massachusetts. Born Jeremiah Jones Colbath in 1812 in Farmington, New Hampshire, one of twelve siblings, he was given up for adoption because his impoverished family could not support him. He legally changed his name to that of his adopted father and took the first name of Henry. Wilson moved to Massachusetts in 1833 and became a shoemaker. He was well educated, attending several academies, and taught public school in the town of Natick. Wilson joined the state legislature in 1841 and served until 1852. For four years of this time he owned and edited a paper called the Boston Republican. He was elected by Democrats and Free-Soilers to the United States Senate in 1855, before joining the Republican Party and serving three more terms. Like many politicians following the Civil War, Wilson took his turn with the military. As senator, Wilson served as Chairman of the Committee on Military Affairs, and during the Civil War, he took a more hands-on role by raising and commanding the 22nd Massachusetts Volunteer Infantry. Wilson became paralyzed in 1873 and died in the United States Capitol Building in November of 1875, before his term had ended. The background is 100% cotton twill, black in color. 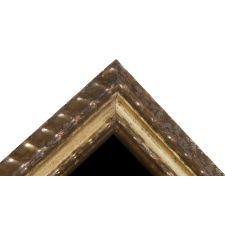 The gilded, rippled profile molding is American and dates to the 1830's. 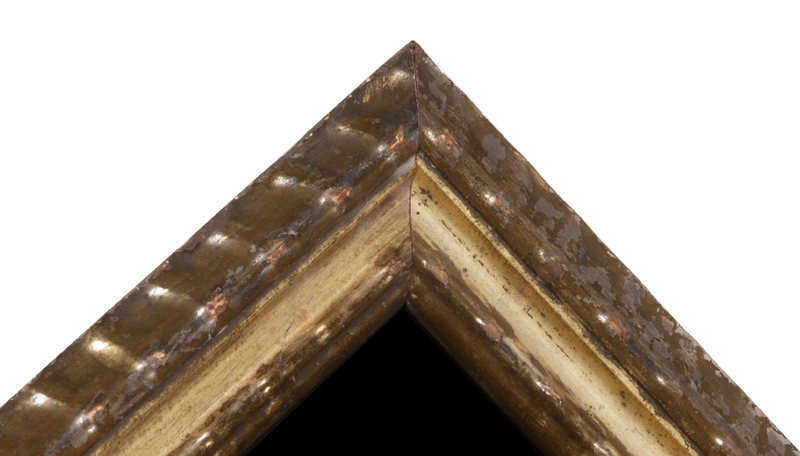 Spacers keep the textile away from the glass, which is U.V. protective. Feel free to contact us for more details. Condition: There is minor foxing and staining in the center medallion, in and around the portrait, and in limited areas outside it within the red ground and border. The extreme rarity as one of only two known examples well-warrants these minor issues.